Prime Minister Netanyahu’s Visit to Washington, D.C. The visit of Israeli Prime Minister, Binyamin Netanyahu, to Washington D.C. and the exceedingly friendly tone of his host, the United States President, Donald Trump, left an impression of the beginning of a completely new US policy in the Middle East. All public aspects of the Prime Minister’s visit point to the conclusion that Washington, under the leadership of President Trump, will have a far more influential and energetic role in the Middle East and particularly so in the search for the long-running Israeli-Palestinian conflict. The so-called “Two-State Solution” was always the foundation for any negotiations between the Israelis and Palestinians. The outgoing administration of President Barack Obama left its mark in the international public domain with strong statements that, without the creation of a Palestinian State next to Israel, there would be no hope for peace. President Trump, in contrast, expressed considerable sympathy to sentiments from Jerusalem where the whole Israeli Government has clearly demonstrated that it has no intention of accepting the two-state solution. The US will therefore have to define its stance on this issue without completely undermining any chance for the resumption of negotiations, particularly given the fact that, without the possibility of two states, the Palestinian side will not be in a position to discuss any prospective solutions. Simply put, if Washington does not leave room for the two-state solution, there will be no negotiations. The only way of doing this without disappointing the very large expectations from the Israeli Government will be to maintain a policy of accepting any solution agreed upon by both sides. What is left unresolved, however, is how the Palestinians could ever accept a one-state solution in a situation where the Israelis are demanding state’s recognition as a Jewish State and could therefore never be democratic conferring the same rights to all of its citizens (Palestinian argument). The greatest gap in US and Israeli policies has always existed with respect to the issue of Jewish settlements. A compromise was sought in the American acceptance of measured expansion of settlements in the West Bank in accordance with the needs of the existing population, also known as “natural growth”. For Washington, any expansion beyond this notion would constitute a direct obstacle to a peaceful solution. In recent weeks, however, Israel has implemented a policy emanating from the far right which considers that all of the West Bank should be annexed as part of Israel. According to this view, the expedient settlement of the territory is only a natural step in that direction. For the Palestinians, this issue has always been on top of the agenda in any conversation on the future of the region and they have, as opposition to the Israeli policy, received the support of not only the US, but also the European Union, not to mention the United Nations. As has been reported, Washington is now requesting Netanyahu to refrain from further construction, obviously at the request of the Palestinians side, in order to push for the possible resumption of talks. The relocation of the US Embassy from Tel Aviv to Jerusalem was one of the biggest campaign promises of President Trump, concerning ME. He adopted such a position under the influence of right-wing Jewish circles in the US who actively participated in his campaign. What was perhaps overlooked in this scenario was, not only the Palestinian strenuous objection to such a move, but the significant opposition of the whole Arab world, which would be a far more serious consideration for US interests. By recognizing Jerusalem as the Israeli capital, the US would in effect give legitimacy to Israeli control, despite having previously supported a UN Security Council resolution which did not recognize Israel’s annexation over the city. Anyone who wants to play an active role as a mediator in future Israeli-Palestinian negotiations should know that recognizing Jerusalem as the capital of Israel in this moment would not only signify the end of such talks (which have not even resumed) but the opening of a new front of very difficult relations with Arab states as a whole. Whether the US could stomach such an outcome, particularly at a moment when it is seeking active Arab support in the fight against Islamic fundamentalism and the Islamic State seems highly improbable. It remains to be seen whether the decision-makers on this issue have gathered as much right away or whether they will do so later. Nevertheless, it is worth noting that the process of relocating the Embassy from Tel Aviv to Jerusalem did not begin immediately upon President Trump’s assumption of power as was previously promised. The nuclear deal with Iran is an issue of considerable importance for the current Israeli Government. It considers it a very bad document which will enable Iran to continue deceiving the international community with the further development of nuclear weapons. This is the same position adopted by President Trump. Where there could be less agreement, however, is what would be the next steps vis-à-vis Iran or, in other words, whether the US is ready to take a tougher position in terms of its intentions. It probably is not right now and will not be for some time regardless of its expected continuation of strong anti-Iranian rhetoric. 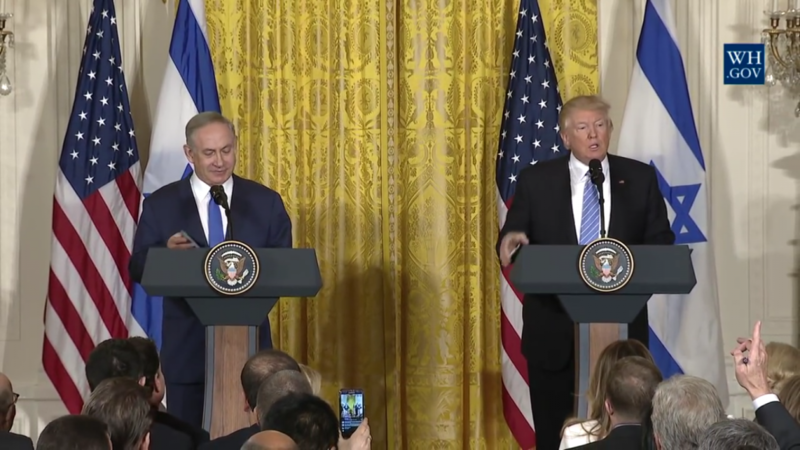 One of the most interesting aspects of Netanyahu’s visit was that the press conference of the two leaders took place before their actual meeting given that the point of such conference is to report on what was discussed and concluded. On this occasion, reporting on what was or was not agreed was avoided which demonstrates that the US still does not have a clearly defined Middle East policy (which is perhaps a good thing) and is considering exactly how to support Israel without undermining its other strong interests in the region (primarily the fight against terrorism). Whether finding such a balance is an impossible mission is yet to be seen but there are signs that the strong statements on the Middle East President Trump made during his campaign will have to be confronted with reality in which the US must strive to bring all sides to the negotiating table and take their respective positions seriously. Israeli expectation from the new American President are extremely highly and perhaps cannot be tempered. Their fulfillment will depend exclusively on whether they actually coincide with US interests. It remains to be seen when such an approach will also become President Trump’s official policy in the Middle East.